During a brief bout with insomnia, I whiled away my early mornings fiddling with a fat broken letter loosely modeled after some wood-block lettering done by Rudy Koch. After the would-be font came to the attention of the folks at House, we thought it might be fun to release it during TypoBerlin 2007 at which we were scheduled to present/perform. Within a matter of weeks I finished the typeface, which was to join four original music tracks—recorded by the House band especially for the event—on the multi-session CD. With some help from Tal Leming, Blaktur also sports a feature called the Udo Dirkschneider Umlaut Randomizer. As a tribute to overly zealous heavy metal band logos, diereses are liberally sprinkled above consonants when the Titling Alternates feature is selected in the OpenType menu. And, in the event that any doctoral candidates in illuminated medieval German Papal manuscript handwriting were looking for the perfect typeface for their dissertation, I included a host of archaic letter forms (ably added under the Historical Alternates feature by Ben Kiel) that would confound even the most astute paleography buff. 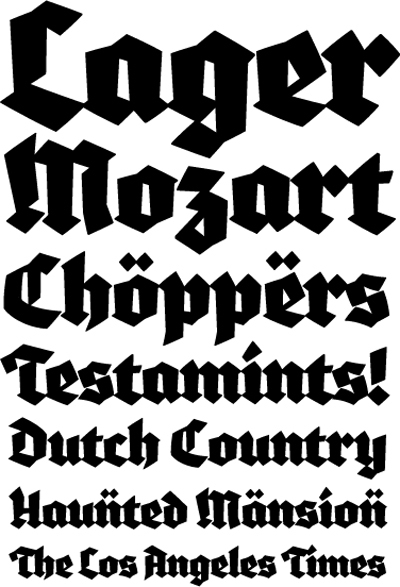 In 2008, Blaktur was awarded the prestigious "Certificate of Excellence in Type Design" by the Type Directors Club. 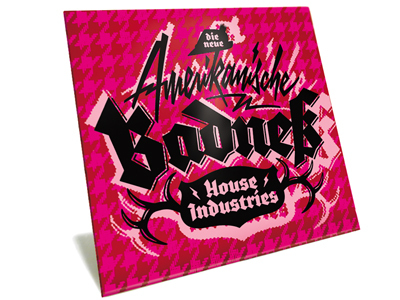 All the more reason that you should get on the horn right now and order Blaktur from House Industries.